“I’ve lost much money, but I don’t regret what I’ve done since it all happened in Koreatown. My failures became fertilizer to bloom flowers." Hi Duk Lee, a Korean business owner in Los Angeles and one of the pioneers of the city’s Koreatown, has died, NBC News has confirmed. Lee's daughter, Helen Lee, said he died March 7, about six months after a cancer diagnosis. The family, which held a private service March 14, was shocked by the number of people who attended. "My father's life is a story of a true American," Roger Lee, his son, wrote in his eulogy. "He took all the risks, and dealt with all the consequences, nevertheless, he did it his way." Lee was born in South Korea in 1939 and moved to what was then West Germany in 1966 due to a lack of economic opportunity at home, he recounted in a video interview for Seoul of Los Angeles, a history of the city's Koreatown. 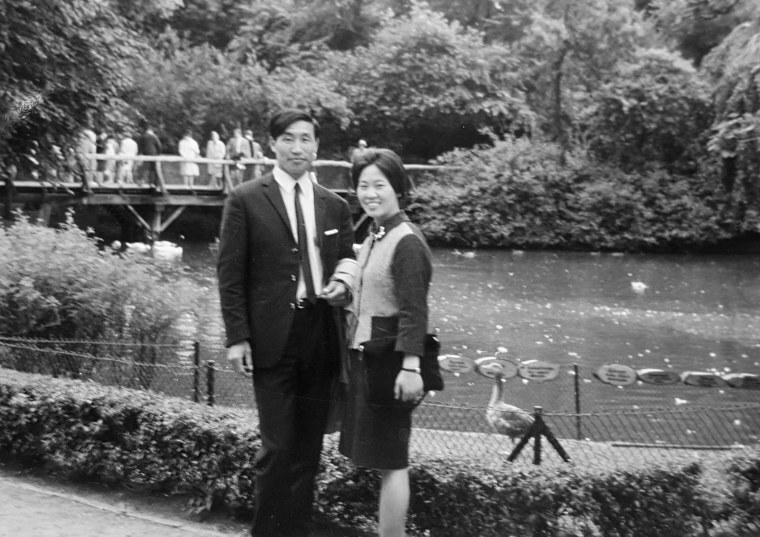 He came to the United States in 1968, eventually inviting a Korean woman, Kil Ja, he had met in Germany to join him. The pair married. She worked as a nurse, and he worked for several years at a can manufacturing company and as a welder. In 1971, Lee opened the Olympic Market grocery store. He ran the store as his wife worked at a hospital, according to Los Angeles Magazine. Lee later opened a restaurant — V.I.P. Palace, which became a gathering place for the Korean community in Los Angeles — and a business plaza. Lee's projects were designed with a Korean architectural style in mind, including roofs made with blue tiles imported from Korea. He was motivated, in part, by the desire to give the nascent Korean-American community a geographic center. "They didn't have any good restaurants for entertainment or a meeting place," Lee told the Los Angeles Times in 2001, referring to the Korean-American community. "I planned to make Koreatown. Chinese people have Chinatowns everywhere: New York, San Francisco, Los Angeles, Montebello. But there's no Koreatown." Lee realized his dream, at least in part. While Korean businesses sprawled out and built up largely as strip malls, then-Los Angeles Mayor Tom Bradley officially named the neighborhood “Koreatown” in 1980, according to the LA Times. The California state Department of Transportation also installed a Koreatown exit sign on the Santa Monica Freeway. Lee sold his property in the neighborhood by 1982, pressured by high interest rates and tenants who had fallen behind on rent. He then explored importing and exporting, spending time in China and South Africa, while still living in Los Angeles. He had a particular interest in exploring developing areas that he knew would boom, Helen Lee recalled. "My dad — whenever he would see an idea, he was always just wanting to explore things," she said. "His home base was always Los Angeles," she added. "He traveled a lot; he went all over the world." In 2016, Lee and his wife opened a plant nursery called Echo Garden, according to Korea Daily. He had grown up on a farm in Korea, Helen Lee said, and had always liked gardening, no matter what else he was doing in his life. "He loved this nursery," she said. "It wasn't really a business to him. Every dime he made, he put back into it." Helen Lee said that people would often come to her father's nursery not knowing who he was, but that many people — particularly students — visited having already researched him. Her father loved that, she said, because he wanted people to be more aware of history.